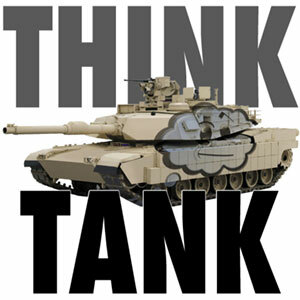 What Makes A Think Tank? I'm thinking it, I'm thinking it! There are many “think tanks” in British politics. Hell, there are many think tanks in all politics. What I find most interesting, though, is where on Earth most of these think tanks come from in the first place. Anyone can start a think tank. It takes a bit of whizzyness on the interweb and maybe a few eyecatching ideas. Doesn’t mean anyone will pay attention to you, though. After all, any blogger in the world could turn themselves into a think tank within minutes, but so what if nobody’s listening? The real key to what makes a think tank work is they normally have a customer: a notable politician within a party who wishes to get their agenda noticed. See Keith Joseph, and the foundation of his Centre for Policy Studies in 1974. The goal there was to turn the Tory party into a vehicle for economic liberalisation, and the idea all along, it seems, was to put their acolyte, Margaret Thatcher, into the driver’s seat. It worked. This is why only a select few succeed. The IPPR has long been seen as central to the New Labour machine, and it certainly provided the breeding ground for a great deal of Labour MPs and party insiders. That success has enabled them to stay a part of the political narrative, even when their ideas are out of favour right now. Is any of this healthy for democracy? Well, it is a free country, and people are free to listen to, or ignore, many of these so-called ideas at their peril. But what concerns me most is the exclusivity of it all. It’s almost as if the political class say that the only ideas worth listening to are the ones from the people who are already well established amongst their elite. The same people who are already fully institutionalised and frequently cannot see that often the most exciting solutions are the most radical, the most unexpected. Sour grapes, maybe, from someone who thinks he has the answer to everything. But then again, so do most other armchair pundits and keyboard warriors. I wouldn’t be a blogger otherwise.